The Perot Museum of Nature and Science is a frequent science destination for us and the Lyda Hill Gem and Mineral Hall is one of our favorite exhibits within the museum. The hall has recently received some updates and while we were checking it out we had the wonderful opportunity to hear Ms. Lyda Hill speak to the guests. 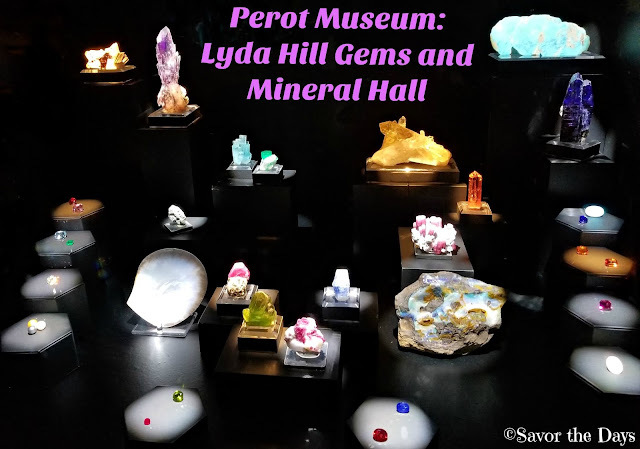 That is, THE Lyda Hill of the Lyda Hill Gem and Mineral Hall! Ms. Hill is one of Dallas' biggest philanthropists and she is passionate about promoting a love of science especially in young people. 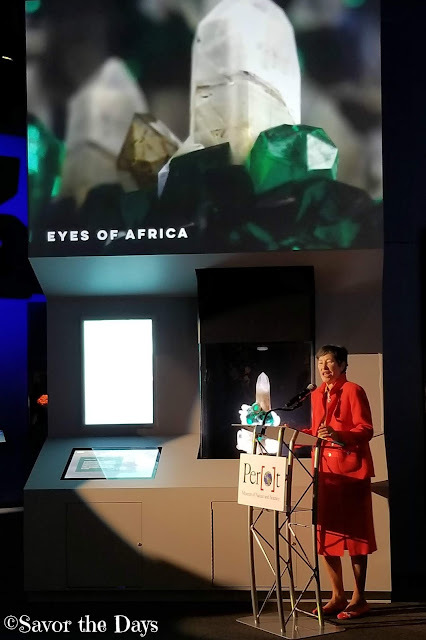 She remembers how she loved to pick up pebbles when she was young and she wants to inspire others to pick up pebbles and explore the world of gems and minerals. You see, gems and minerals are a "gateway science". 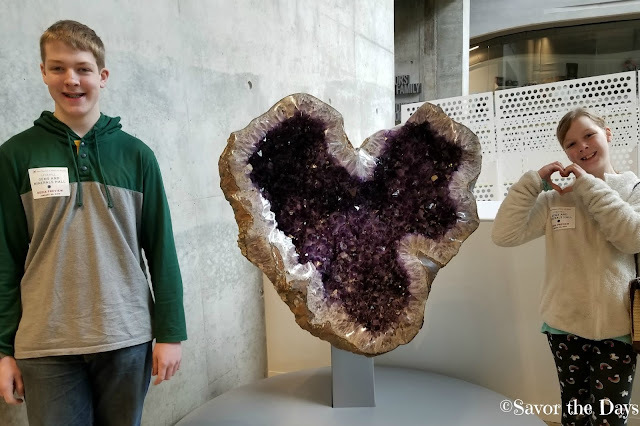 Kids who might not have much appreciation for formal science will still be fascinated by interesting or sparkly rocks. 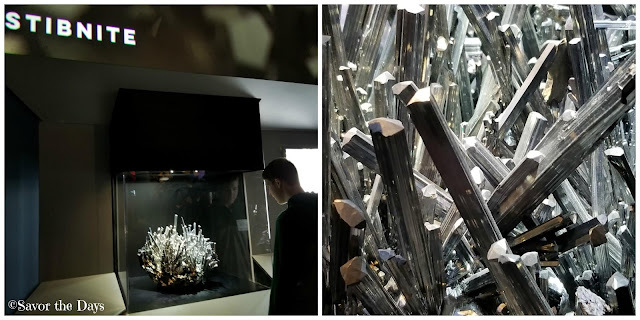 As they develop a love for gems and minerals, other doors of interest might open for them into related sciences like chemistry, geology, art, geometry, art, etc. The Lyda Hill Gem and Mineral Hall has four signature displays. Their 5 foot tall amethyst geode has always been an impressive site. The Eyes of Africa is a show-stopping fluorite found in the "Alien Eye" pocket in Namibia, Africa. It has symmetrical black outer zones framing diamond-shaped vibrant green cores. This beautiful piece is on loan from Lyda Hill. Stibnite, also known as Antimony Sulfide, is one of Nicholas' favorite displays. 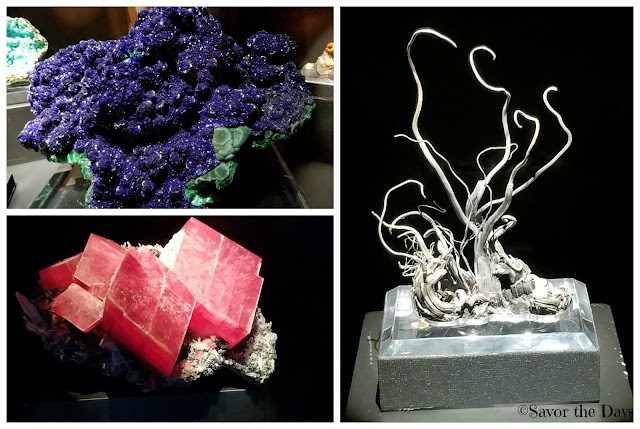 It is a robust cluster of crystal formations recovered from an industrial ore mine in Jiangxi Province of China. It is an amazing piece. 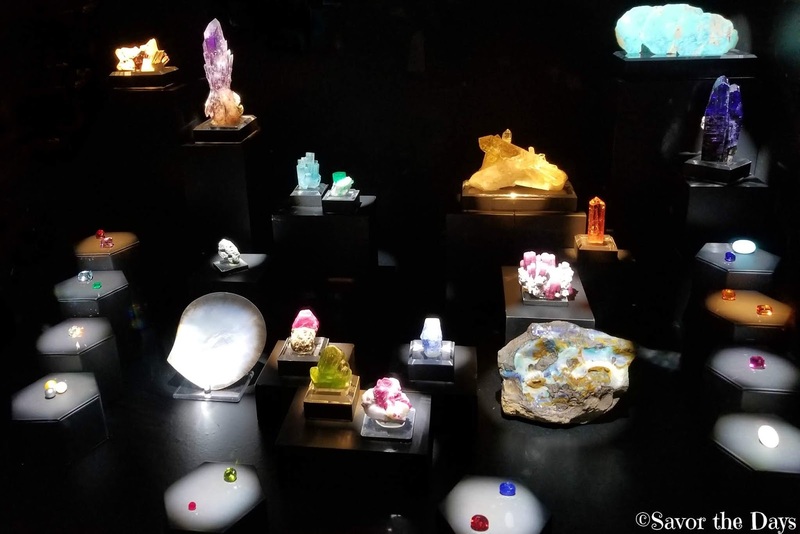 And finally, the monthly birthstone case displays the rough and faceted forms along with a special display of beautiful jewelry featuring the current month's gem. 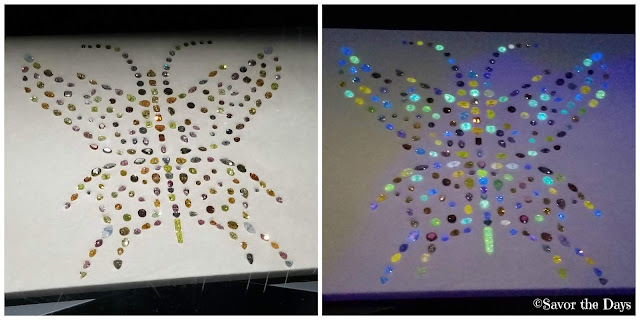 We admired the Aurora Butterfly of Peace, a 240 colored diamonds, some of which fluoresce under UV light. This piece symbolizes "a spiritual connection to Earth for all humankind". 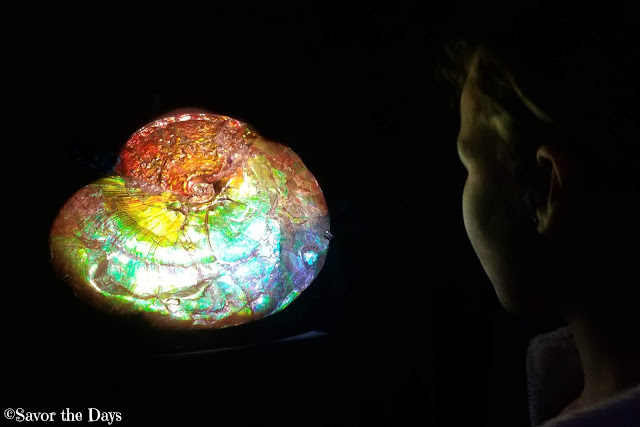 I am in love with this Ammonite fossil that has an iridescent coating of Aragonite. It was found in Canada. 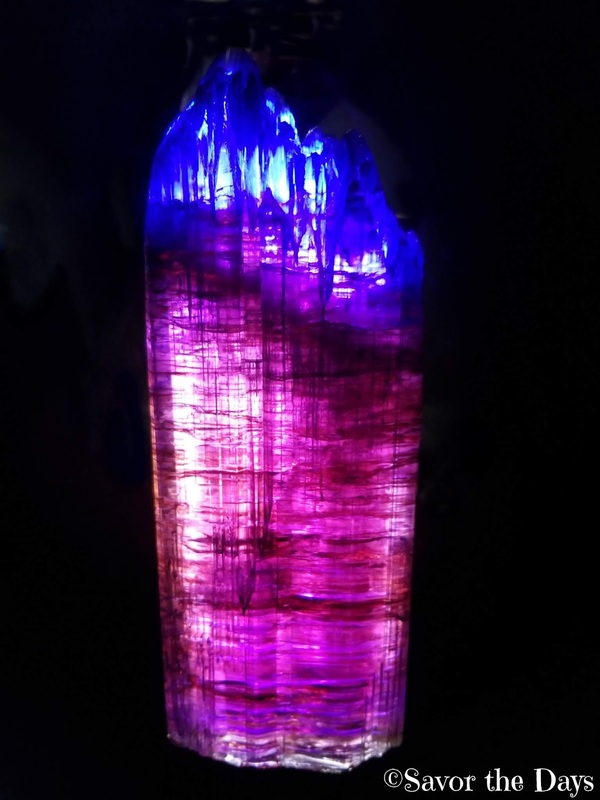 As we were admiring this amazing piece of Tanzanite, Ms. Lyda Hill came over to speak to us!! This is one of her pieces that she has loaned to the museum. 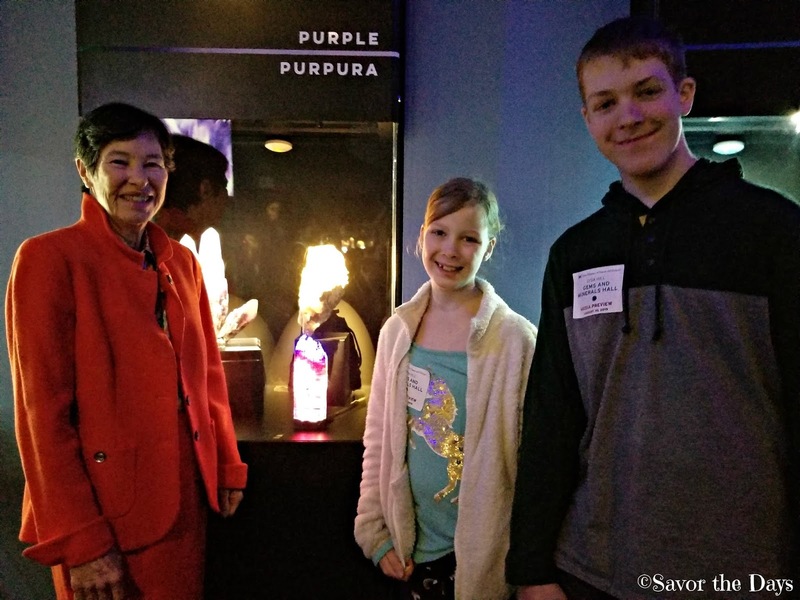 She talked to us some more about her passion for inspiring children and adults to learn more about nature so that they will take care of this planet for the next generation. We enjoyed hearing her stories about a few of her other pieces on display at the museum. 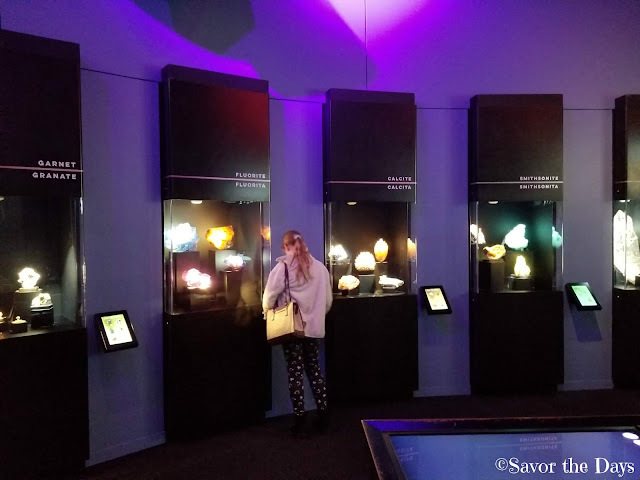 There are sections in the hall based on color, based on the country where the specimens were found, and based on the type of gem and mineral. It makes it really interesting to look at the pieces this way. For example, these three pictures below all represent rhodochrosite but look how different they look from each other. There are also several interactive screens where you can see what different minerals are made of or play a head-to-head game to test you gem and mineral knowledge. Here are a few of our other favorite specimens in the hall. 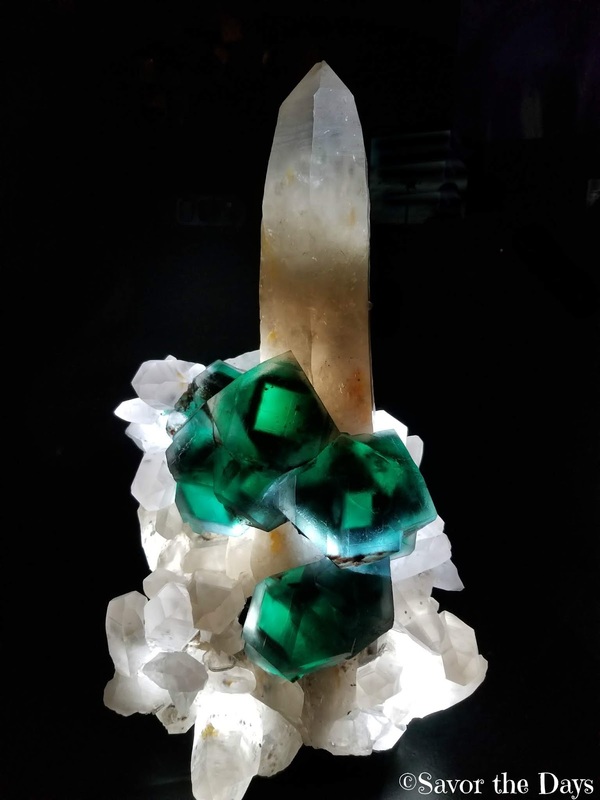 I like the rich purple and turquoise of the Azurite/Malachite piece. The stringy slivers of silver are one of Nicholas' favorites. 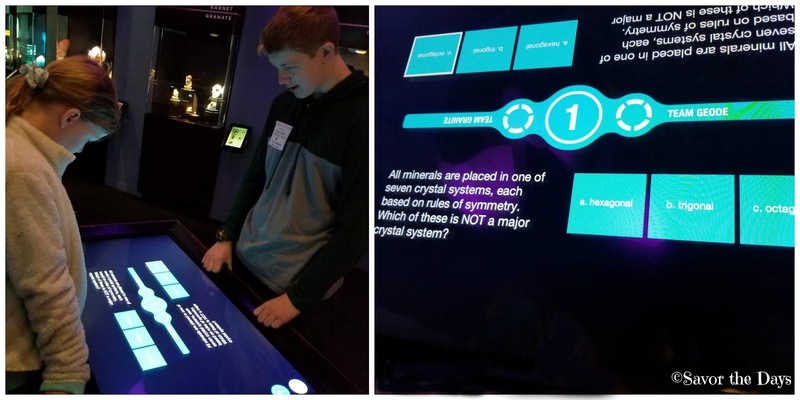 We love being inspired to learn something new every time we visit the Perot Museum! 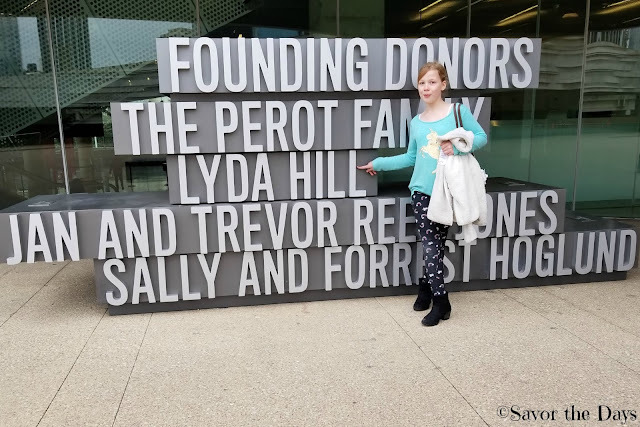 As we were leaving the museum, Rachel proudly pointed out that we actually spoke to one of the founding donors of the Perot Museum of Nature and Science. Come check out the amazing new look of the Lyda Hill Gem and Mineral Hall but make plans to come back later in February for the museum's upcoming special exhibit, The Art of the Brick, featuring the world's largest display of LEGO art! You can bet we will be back for that! 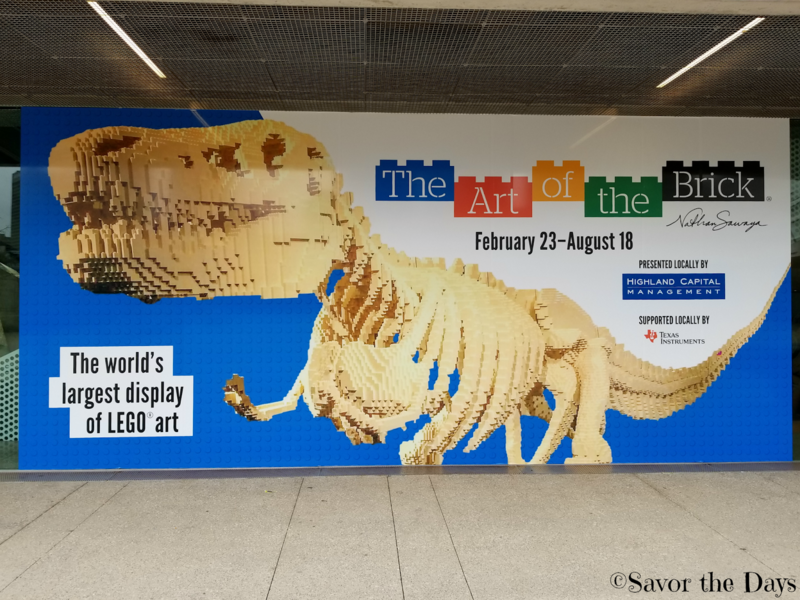 The Perot Museum of Nature and Science is located at 2201 N. Field Street in Dallas. For more information, please visit their website at https://www.perotmuseum.org/.